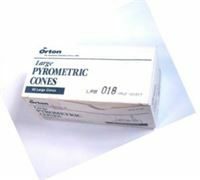 Pyrometric cones have been used to monitor ceramic firings for more than 100 years. They are useful in determining when a firing is complete, if the kiln provided enough heat, if there was a temperature difference in the kiln or if a problem occurred during the firing. Cones are made from carefully controlled compositions. They bend in a repeatable manner (over a relatively small temperature range - usually less than 4.5°C. The final bending position is an indication of how much heat was absorbed. 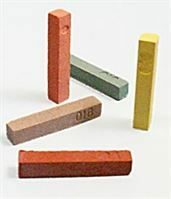 To make a more accurate assessment of your kilns performance, use three cones as illustrated below. 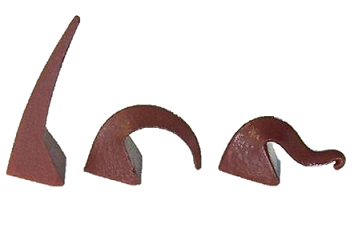 The target cone is 06 in the middle and is down perfectly; the guide cone, number 07, is the one on the right, it is one cone cooler and is over fired: the guard cone number 05 ½ is the one on the left, it is one cone hotter and is underfired. Typically, it takes 15 to 25 minutes for a cone to bend once it starts. This depends on the cone number. The cone bends slowly at first but once it reaches the half way point (3 o’clock), it bends quickly. When the cone tip reaches a point level with the base, it is considered properly fired. This is the point for which temperature equivalents are determined. Differences between a cone touching the shelf and a cone at the 4 o’clock position are small, usually 1 or 2 degrees. Please call us on 01782 319435 with any firing queries you may have and we will do our best to help you. We sell standard cones and minibars in boxes of 50, and self supporting cones in boxes of 25. Use only mini-bars/cones for the WP Dawson Kiln Sitter.